In the previous Dragonmark, I wrote about the difference between arcane and divine magic. 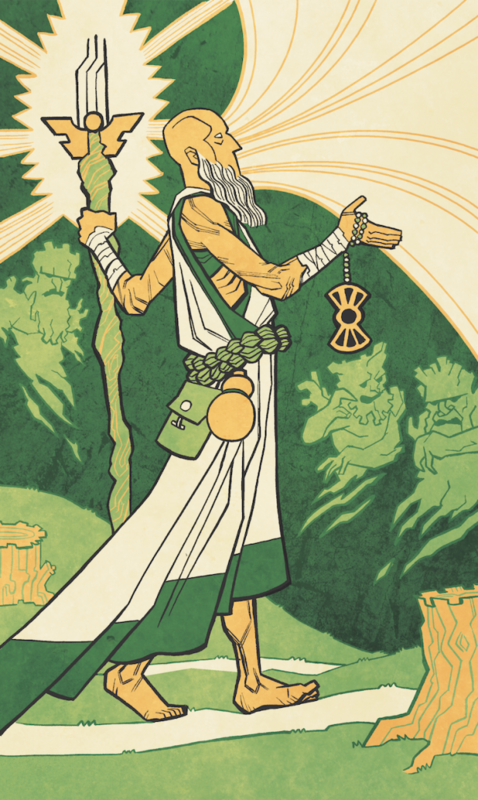 As I mentioned there, I prefer druidic magic to be an entirely separate path as opposed to a subset of divine magic – taking the 4E approach of making druids and rangers primal casters. If you believe the myth of the Progenitors, arcane and divine magic both draw on the power of Siberys, while primal magic is the power of Eberron – the world itself. This reinforces the idea that druidic magic is natural magic, and fundamentally different from either arcane magic or divine magic. HOW DOES YOUR DRUID CAST SPELLS? Primal magic doesn’t require belief to function… but that doesn’t prevent humans from layering belief on top of it. Each druidic sect has its own approach, and ultimately it’s up to you to decide how your primal caster operates. When you perform a spell, what do you do? Here’s a few approaches. You invoke the spirits of nature. You speak to the storm and ask it to strike your foes. You call to primal spirit of the Hawk and ask it to lend you its wings. You know secret words and rituals that let you channel natural forces – one word that calls the storm, another that gives you skin of bark. There’s more to this than just the word itself; it’s about understanding the storm and the tree. Nonetheless, you don’t actually talk to the storm; you simply know how to make lightning strike your enemy, the same way a farmer knows how to plant a seed so it will grow. You understand nature in a way most people do not, but to you this isn’t magical; it’s natural. All things are connected through Eberron. You are already connected to the hawk and the storm. You don’t invoke them with secret names or address them as spirits; you simply reach through that connection and draw on the power you need. When you heal someone, you are helping them draw on their own connection to the primal lifeforce; when you hurt them, you are reaching through that connection and channeling disease. You are a champion of Eberron, empowered by the world itself to protect her. She created the storm and the hawk, and she gives you dominion over them. You are the hand and the voice of the Wild. In a sense, primal lies between divine and arcane, and the question is which end of the spectrum you fall under. Do you interact with spirits the same way a priest might speak to angels? Do you believe that you are a champion of the world as a paladin is a champion of the Silver Flame? Or do you believe that nature simply is, and the magic you perform is no more “magical” than a tree growing from the seed – you just know how to make natural things happen on demand? Rangers serve as the warriors of the Eldeen druidic sects. They are primal characters in 4E and use druidic magic in 5E. Thus, as a whole, they fit the concepts presented above, and rangers from the Eldeen sects will follow the belief framework of their sect. However, it may be that you have an idea for a ranger that doesn’t really fit any of these. You want to be an awesome hunter, but you don’t really see your character thinking about “the balance of nature” or anything like that. If you want a not-so-druidic ranger, here’s a few approaches. You can characterize your ranger’s spells as being more “tricks” that they’ve picked up. Perhaps you cure wounds using a salve you’ve learned to make, or create a fog cloud with a smoke grenade. Your hunter’s mark or jump could simply be driven by skill, and detect magic an innate sense of things. Mind you, all of these things WOULD still be magic, and could be dispelled, detected, etc – but it’s more that you’ve jury-rigged things that produce magical effects as opposed to having a deep connection with the power of nature. Personally, I’d have no objection to a ranger who wanted to define his spells as arcane (reflecting a scientific approach to magic) or entirely divine (tied to his faith to Arawai or Balinor, for example). I wouldn’t change the spell list, as that’s part of the class balance, and because they can choose spells that fit what they are looking for – but I’d be happy to consider their magic to be arcane or divine instead of primal for any magical effects that relate to such things. You can simply play a ranger who doesn’t use spells; one version of this was presented in this Unearthed Arcana article. To date, most of the focus on primal magic has been on the druidic sects of the Eldeen Reaches. Aside from the primary setting guide, you can find more details on these sects in the Player’s Guide to Eberron and Faiths of Eberron. Each of these sects is primarily concerned with a different aspect of nature. Here’s the very short version. The Wardens of the Wood are about balance. They help people live in harmony with nature, and act to protect both the innocent and the wild. They are the largest of the Eldeen sects and the one that gets the most new recruits, as they actively work to help and protect the people of the Eldeen Reaches. The Gatekeepers are about protecting nature from the unnatural. They fight the forces of Khyber and Xoriat, and maintain the seals that hold the Daelkyr at bay. The Children of Winter are about the cycle of life… and death. They believe that civilization has thrown this cycle out of balance and use disease and other means to test and thin the herd. They further believe that there will come a time when an apocalypse cleanses the world, clearing a path for its rebirth. Some of them believe the Mourning is the first stage in this disaster… and that it should be welcomed and accelerated. The Ashbound oppose civilization. They despise agriculture, cities, and all the ways in which civilization seeks to control or abolish the natural world… but they are especially opposed to those who warp the natural order with unnatural magic. They are the most zealous and dangerous of the sects. This sect includes a significant number of barbarians along with rangers and druids. The Greensingers are ambassadors to the Fey. They linger in areas that are close to Thelanis, and often travel between the planes. While they are most strongly connected to the Fey, some Greensingers are more broadly interested in traffic with all of the planes. The critical thing is that these five sects are NOT all of the druids in the world! To begin with, we’ve said that there’s around a dozen active sects in the Eldeen Reaches (which obviously means that there were thirteen, but one’s gone missing). We have never described the other Eldeen sects, because this is part of “There’s a place in Eberron for anything in D&D…” We intentionally left those other sects open so DMs have an easy place to drop in new sects of their own or interesting sects from other settings or sourcebooks. It’s possible we will add others in future material; I have an idea for a shifter sect with a focus on shapeshifting and living among the beasts of the wild, which hasn’t made as much of an impact as the others because its members are largely invisible within the woods. But the point is: These five sects exist to give you hooks to play with, but they are not intended to cover every possible sect. Beyond this, within canon we’ve already presented a number of other druidic sects. If I had the time to go through every sourcebook, I’m sure I could find more examples of druidic sects. The five named sects are those with the greatest impact on the Five Nations, and have been cast into the spotlight by the Eldeen secession. But you’re not limited to these five choices when you make a primal character of your own. What do the Ashbound and Children of Winter think of the Undying Court, to the extent they are aware of each other? Have the Followers of the Broken Path had any significant contact with the other druid sects? Do the Gatekeepers nowadays a connection to the Wordbearer Dhakaani? I’m merging all these together because they are all variations of the same question, which is how much contact do the Eldeen sects have with the rest of the world? The answer: not much. There’s a reason we call them the ELDEEN sects. We’re used to a world that is filled with information, where TV and internet keep us in constant contact with the entire world. Not only does Eberron lack these things, but the druid sects – especially the Ashbound – largely avoid the tools that do exist; the Ashbound aren’t going to go use House Sivis speaking stones or pick up the latest chronicle. The Wardens of the Wood rose up to protect the people of the Eldeen Reaches during the Last War; but during the thousand years Galifar was unified, they rarely left the Towering Woods. With that said, some of the sects have taken an interest in the wider world recently BECAUSE of the Mourning. Children or Winter have ventured east to study the Mourning and to bring Winter to the great cities of the Five Nations. Some Ashbound believe they must strike deeper at the heart of civilization; some Gatekeepers want to reach out to find help in their struggle. These are things you can expand upon to meet the needs of the story you want to tell. But BY DEFAULT the Eldeen sects have little knowledge of or contact with the world beyond the Towering Woods. Among other things, this means that as a player character from one of these sects, you may be a trailblazer. The Gatekeepers haven’t been in contact with the Wordbearers or joined forces with the Kalashtar to fight the Dreaming Dark… but YOUR Gatekeeper might be the druid who restores the ancient alliance with the Dhakaani or negotiates new ties to the Kalashtar. This ties to the general philosophy of Eberron: YOU should be the people at the heart of events that change this era. There are many groups that share common interests with the Eldeen sects… but it’s up to you to establish those ties. It’s not so clear to me what’s the goal of Children of Winter. Do they want to kill any human life? From Dragon 418: When Eberron created life, she also created death. She gave the asp its venom and set plagues loose in the world. All these things have their purpose. Now you have pulled the serpent’s teeth and leashed the plagues with magic. Our mother will not be mocked, and her wrath is coming soon. This is in the voice of one of the Children; a later section is clearer. Although they surround themselves with vermin and the trappings of decay, the Children see themselves as champions of life. They believe that all natural things have a purpose, even those that seem malevolent. Death clears the way for new life. Disease weeds out the weak. The Children work to preserve this cycle. The Children despise the undead and destroy them whenever they encounter them… and if they WERE aware of the Undying Court, they’d despise it as well. Positive or negative energy means little to them; the simple fact is that these elves have placed themselves outside the natural cycle, and no good can come of it. And while they aren’t as dedicated to it as Gatekeepers and have no specialized spells, the Children will also fight aberrations or similar unnatural threats if they encounter them. So why do the Children kill people? What’s their real goal? Let’s look back to Dragon 418: Like most druids, the Children see Eberron as the source of all life and the spirit of the natural world. They believe that she had a grand design for nature, a purpose yet unfulfilled. And they believe that if humanity strays too far from the path of Eberron’s design, she will wipe the slate clean and start again. It’s not simply that the Children believe that people are “breaking the rules” with their medicine and their Undying Courts; they believe that these things THREATEN EVERYONE, and that if we don’t get the population under control the WORLD WILL BE DESTROYED. By spreading disease, they are using the tools nature designed to weed out the weak and reduce population. A significant number of Children believe that the Mourning is the harbinger of this “Winter” – the apocalypse Eberron will use to wipe the slate clean and start again. This has created a subsect whose members welcome this; this world is too far gone, and they want to bring down the Winter and reset the world. However, other Children oppose this and still believe the current world can be saved. Are the Children of Winter aware of all the cosmic threats like Daelkyr, Lords of Dust and so on? Do they care? No more than most people. WE know about the Lords of Dust because we have a cool book that spills all their secrets – but they are a conspiracy that has successfully remained hidden for thousands and thousands of years. The Children fight aberrations when they encounter them, but in short, the Daelkyr haven’t been a serious threat for thousands of years and the Overlords haven’t been a threat for tens of thousands of years. They’ve GOT a thing that they know about that is a real serious issue, and that’s what they worry about. Side note: Back in the day, when Bel Shalor was almost released… to the degree that the Children of Winter were aware of the troubles of Thrane, they might have considered THAT to be a possible harbinger of Winter. As I understand the Gatekeeper sect, most of it’s knowledge came from Vvaraak’s teachings a long time ago. And most of it is lost today, especially the underlying magical principles of the seals and the annual ritual. They merely follow rituals they don’t understand any more, at least not in the fullest. So, in my understanding, they would not be able to repeat the ritual they used to seal the Gates to Xoriat – right? Are the gatekeepers aware that Vvaraak was/is a dragon? If need be, would they try to find her today or seek help from another dragon? A true child of Eberron, Vvaraak foresaw a disaster that would wound the world itself. The Conclave had no interest in this struggle; just as the dragons had stood aside while the giants of Xen’drik battled Dal Quor, the elders of the Conclave told Vvaraak that they would act when a clear threat to Argonnessen existed, and not before. As a whole, the dragons aren’t your friends. They aren’t here to help. They stood by and watched as the Xoriat Incursion tore apart the Empire of Dhakaan. They did nothing during the Giant-Quori War. Heck, they attack Aerenal on a regular basis just so the kids can earn their wings. The one time they took decisive action was when the giants were preparing to do something that would threaten Argonnessen… and they dealt with that by utterly destroying giant civilization. Vvaraak was an extremely rare individual who truly cared about the lesser races – but that’s not a common thing. I read that the gatekeepers have friendly connections to the Chamber and sometimes their scholars (known as dragons?) come to converse with the druid elders. If that’s true, why not simply ask a visiting dragon what to do if something with the seals/Daelkyr threat is … threatening? Or how to repeat the ritual properly? It is true that over the centuries the Chamber has established Siberys Observatories in the Shadow Marches. But you’re making the mistake of thinking of the Chamber as “good guys” who would help if the people needed it. The Chamber monitors the Prophecy and ensures that it remains on the approved path. The only way to monitor the Prophecy is to have agents across the world. Essentially, the Chamber is using the Gatekeepers to collect data, which they can periodically pick up. The Gatekeepers don’t fully understand what they are doing, and I don’t think their Chamber contacts identify themselves as dragons. Even if they did, they would only help if it was part of the approved path of the Prophecy. It’s entirely possible that a Daelkyr Uprising IS part of the approved path, in which case not only would the Chamber not help them stop it, they’d actively mislead them to keep things on track. Generally speaking the Chamber is better for us than the Lords of Dust, because their endgame doesn’t involve the release of demonic Overlords. But they are not our friends. Vvaraak broke with the Chamber when she taught the Gatekeepers. What do the Gatekeepers think about the prophecy? Do they have druids specialized in deciphering the prophecy? Is it incorporated in their daily life somehow? Yes and no. There are Siberys Observatories in the Shadow Marches, and the Chamber has got the Gatekeepers monitoring these and collecting the data they need for occasional pickup. This data MAY be useful in the short term at predicting events within the Shadow Marches, and the Gatekeepers undoubtedly believe that it will give them advance warning of a Daelkyr resurgence. However, they are not capable of monitoring the Prophecy as a whole from one location, and the scope of the Prophecy goes way beyond the Marches. It takes a group like the Chamber, Lords of Dust, or Undying Court – immortals with vast resources and power – to be able to put together the bigger picture. So there are druids who specialize in using the Observatories, and in using them to predict local events and monitor the seals, but they aren’t concerned with the wider scope of the Prophecy. The Gatekeeper community getting smaller with every generation, so it gets more challenging to maintain the seals. Are there seals all over Khorvaire or are they all located in the Shadow Marches/Eldeen Reaches/Demon Wastes? It has been established somewhere that the location of the seals doesn’t correspond to the physical location of the imprisoned Daelkyr. With that said, in MY campaign many of the seals are highly portable. There are a few seals that are vast buried stones, but a seal could also be a pendant, or a ring, or embedded in a staff. In this case it is possible that prophecy dictates where a seal must go; it could be that to function, one of the seals needs to follow a particular path or visit a series of locations. All of this is a great foundation for a Gatekeeper PC who is assigned to carry one of the seals, and who must take it to certain dangerous places to maintain its power. How many seals do the Gatekeepers maintain? Somehow I recall that there are 6 (or7) Daelkyr left in this world and I assumed that therefore there are 6 (or 7) major seals as well, probably accompanied by smaller ones. Is this defined in canon material? And if not, how would you do it? There are six Daelkyr that have been called out by name, however the Player’s Guide to Eberron states “These are undoubtedly among the most powerful of their kind, with abilities beyond those presented in the EBERRON Campaign Setting.” So there are as many Daelkyr as you need for the purposes of your story, and the same holds true for the seals. Given that you’re talking to ME, obviously I would say that there were thirteen seals, but one has already been destroyed in the past, and many believe that this is why the Daelkyr are stirring now. Not off the top of my head. It’s certainly a topic I’d love to explore if Eberron gets unlocked for the DM’s Guild! Am I right in thinking that you wouldn’t really have creatures of Thelanis considering themselves Greensingers or druids? You are correct. With that said, the Greensingers themselves are the least “druidic” of the Eldeen sects. We’ve already noted the fact that they sometimes multiclass with arcane classes (typically bard)… and as far as their druidic magic goes, they are much more in the model of “I know the secret name of the storm, so I can ask it to smite my enemies” than “I am a servant of Eberron.” Shapeshifting is also a common strength of Greensingers, in part in emulation of the fey who aren’t bound to a single form. It’s hard for me to imagine the native inhabitants of Thelanis or Lamannia taking up druidic traditions per se – even if it weren’t “the magic of Eberron itself”, Thelanis isn’t the same kind of natural world that druids care for. First of all, I wouldn’t include Lamannia in this equation. The Greensingers have strong ties to Thelanis, largely derived from the presence of the Twilight Demesne. They have no particular attachment to Lamannia. Aside from that, the Greensingers themselves don’t care for the natural world in the way that most druids do. The Greensingers look at what nature COULD be. They see the story. They imagine that the wind is singing a song, that the tree truly dances in the wind… because in Thelanis, it does. If you wanted, you could decide that Greensinger magic is actually slightly different from that of other druids… that rather than drawing on pure nature, they are temporarily imbuing the world around them with a touch of Thelanis. A dryad isn’t a natural part of Eberron, but it could be that a Greensinger temporarily creates a dryad in a normally natural tree. Even if you don’t go that far, that’s how the Greensinger sees it. They see the world as a magical place, and it becomes more magical around them. How are the Wardens of the Wood inserted in the geopolitics of the Reaches? Since they were a very active part of the independence, and there is very little about how the region is organized. When the plains folk seceded from Aundair, the Wardens trained their militias and fought at their sides. In their gratitude, the folk turned to the study of the druidic mysteries, and this helped make the land remarkably fertile. Today, Warden rangers patrol the entirety of the Reaches, fighting bandits, poachers, and other interlopers. Long dominant in the forest, the Wardens have spread out into the plains to ensure order throughout the region. Each village has a druid counselor (of anywhere from 1st to 7th level, depending on the size of the community) who provides magical assistance and spiritual guidance, and who advises the leaders of the community. Councils made up of representatives from each farming family govern each of the communities. Bands of Warden rangers patrol the forest, responding to threats as they arise. As a side note, some of these druid counsellors might be gleaners. But the short form is that the Wardens advise and protect, but do not rule. Also note that while the Wardens patrol the entire region and settle any disputes between villages, each village does have its own mundane militia – trained by the Wardens, but not made up of primal-classed characters. What do the Ashbound think of clerics and their divine magic? That it’s the unnatural result of trafficking with alien spirits. At the end of the day it’s manipulating the same energy wizards do, and they have no love of it. It’s possible a priest of Arawai or Balinor would meet with their approval if he SEEMED primal. But generally, if it’s not natural magic, it’s UNnatural magic. Finally I am thinking on a campaign focused on the Ashbound. In that campaign they behave like real terrorists. They are fundamentalists, but they are right. Mourning happened because too much of magic has been used. So, here comes the question: if THAT is what caused the Mourning, who should know that? Lords of Dust, Chamber, the Twelve, a daelkyr, someone in Daanvi? How should they react? The idea that the Mourning was caused by the extensive use of war magic is one of the popular theories within the world, and it is a primary reason for the Treaty of Thronehold: the fear that continuing the war will simply cause the effect to spread. As for who would KNOW THIS WITH ABSOLUTE CERTAINTY? That depends on where you want to go with it. The Twelve are a weird choice, but not out of the question. You could say that Cannith knew that the extensive use of war magic was a danger but concealed this information because hey, their business is about selling war magic. If this is the case, it can be argued that THEY CAUSED THE MOURNING. That’s an interesting plotline to me, because what are you going to do about it? This is especially true if it was known to the Twelve – if the leadership of all of the houses were complicit in hiding this information and continuing to push the world closer to doomsday. The Lords of Dust or the Chamber work if you want to say that the Mourning was foretold by the Prophecy. If it’s the Lords of Dust, I would argue that the Mourning is in fact the visible manifestation of weakening the bonds of the Overlords, and that at least one Overlord was released on the Day of Mourning and now lingers in the Mournland as it regains its power. So the action was caused by overuse of magic, but there is worse still to come. Assuming that it was the result of human action, another twist on the Twelve being behind it would be to have the information shared or revealed by the Dreaming Dark, who have plucked it from the dreams of one of the Twelve conspirators. What’s their angle? I don’t know. But if you want to bring in another faction, that’s an option. Are the druid sects a religion? If so, the vast majority of “druids” and “rangers” are really not classed individuals, and don’t have the capabilities of a class level PC. It seems to me this distinction is always reinforced by you with wizards (most are magewrights) and clerics (most are even adepts) but is never touched with druids. This is really two different questions, so I’ll address them in order. There is a spiritual component to the beliefs of the different druidic sects: live in harmony with the world and your surroundings. Some – on an individual basis – take this further and see themselves as champions of Eberron; but other members have a more pragmatic view, and that’s fine. Again, primal magic doesn’t REQUIRE belief the way divine magic does. A sect provides guidelines for how a person should live their life, but it doesn’t necessarily tell them what they must believe. As for your second point, there’s once again multiple answers. Every sect generally has a large number of common people who share their general beliefs and approach to life. This is especial true of the Gatekeepers. When talking about the Shadow Marches we say that a significant portion of the population follows the Gatekeeper traditions. This doesn’t mean they are druids, that they know anything about the seals other than ancient stories, or that they are ready to fight aberrations; it simply means that they tell the stories of the Gatekeepers, respect their traditions, and would welcome and honor an actual Gatekeeper druid who shows up. The same is true of the Wardens in the Eldeen Reaches. There are many commoners who are ALIGNED with the Wardens, but they wouldn’t actually CALL themselves Wardens of the Wood. Further, for every classed Warden, you might have a half dozen initiates struggling to master their skills, or working to help the sect in support roles. With that in mind, when we say “Wardens of the Wood” or “Gatekeepers”, we are generally referring to the elite core of that sect – the people who do have primal classes, and who actively pursue the goals of the sect. Now, most of these people would top out at first or second level, but this IS remarkable; this one reason the Reaches were able to secede and why they still haven’t been reclaimed. It’s why groups like the Ashbound and Children of Winter are serious threats even if each may have less than a thousand active members: they are small groups of exceptional people. With THAT said, part of the issue is that core D&D doesn’t have a primal NPC class – an equivalent of an adept or magewright. Which is why I made one. Years ago I made a primal NPC class called The Gleaner. This was posted on Giant In The Playground, but hasn’t been used elsewhere. It is precisely what you’re looking for here, and yes, for every full druid in the Wardens of the Wood you have a number of Gleaners who travel the Reaches and the woods helping those in need. While D&D doesn’t have a system in place for someone “evolving” from one class to another, I would personally say that many druidic sect initiates begin as first level gleaners and then evolve into rangers or druids once they fully master their skills. In general, do how the sects see each other? Are druids of different Eldeen sects more friendly to each other than a random person they meet? Do they all pay some respect to Oalian? Despite their differences in belief, Oalian supports all the druids, since each sect embraces an aspect of the natural world. In return, most druids respect Oalian as the ultimate spiritual authority in the region, and they gather at The Greenheart for important conclaves and rituals. Beyond that, I’d say that in general the active members of the sects will treat primals of other sect with respect, and they might work together to resolve certain problems; they joined forces during the Eldeen Secession, and members of any sect would join together to deal with undead or aberrations in the woods. But that won’t prevent Wardens from opposing members of other sects who are endangering innocents; there have certainly been many clashes between Wardens and Ashbound in the past. If the druid sects would be aware of the Aundarian plans against the reaches, could they start a war against Aundair? Would it become a new global war? In thinking of the capacity of the Reaches to wage war, bear in mind that they are not a normal nation. They are a collection of villages and small communities, and the closest thing they have to a single leader is a tree. They don’t have a strong industrial base to create weapons of war. Their population is a fraction of Aundair’s, let alone the other nations. One of their greatest strengths is their strong bond to the Towering Woods and their ties to the manifest zones and magic of the woods; once they lead an army into hostile territory, they lose that. And if they were to invade Aundair, what would victory look like? Would they try to actually occupy it in some way? It’s not like the people of Fairhaven are suddenly going to adopt the lifestyle of the farmers to the west. So no: I don’t see the Eldeen Reaches waging a full-scale war against Aundair. With that said, I could certainly see them engaging in GUERILLA warfare. If Aundair begins building up forces in preparation for reclaiming the Reaches, they could definitely launch targeted strikes to take out caches, depots, or research facilities. Part of the point is that the Reaches don’t have either the infrastructure or the numbers of Aundair… but what they do have is a small but elite force. If it came to a straight-up war, Aundair simply outnumbers and outguns the Reaches. But with an army of rangers and shapeshifting druids, the Reaches are well-suited to covert strikes before disappearing back into the woods. The Eldeen sects are so named, as you say, because they’re native to the forests of the Eldeen Reaches. Do you think their particular philosophies or concerns are tied to that location, or are they the sort of thing that might have arisen independently in other regions and/or taken root there if brought by a rare wandering druid? Geography definitely plays a role. The Greensingers largely came about because of the Twilight Demesne, while the Children of Winter have a connection to the Gloaming. Proximity to Aundair is definitely a factor for the Ashbound. This is particularly relevant to the Greensingers. The Eldeen sect has a strong connection to the Twilight Demesne. But if you’re using the 4E story, I’d say that you could have similar sects in any of the regions where Feyspires manifest – essentially, anywhere that has a strong, ongoing connection to Thelanis. These would share similar traits – fey ambassadors, blending druidic and bardic paths – but they wouldn’t necessarily call themselves Greensingers. WITH THAT SAID… you could just as easily say that the Greensingers began in the Twilight Demense, entered Thelanis, and from Thelanis spread out to such places… and thus make them all part of the same sect. You’ve mentioned previously that each sect tends to fight one enemy, Aberrations for Gatekeepers / Undead for Children of Winter, is there a sect setup to fight the Lords of Dust? or Demons / Devils in General? The Overlords aren’t bound by a natural force; they are imprisoned by the SIlver Flame. Thus they are primarily opposed by forces that channel the SIlver Flame, like the Ghaash’kala orcs. So no: at present there is no canon druidic sect that focuses on fighting demons. On the other hand, I’d think EVERY sect WOULD fight demons if they encountered them. Tied to this: the sects often have one foe they are most concerned with, but they’ll still fight the others. The Gatekeepers are focused on aberrations and the Children despise undead. But the Gatekeepers will definitely destroy undead and the Children will hunt down aberrations that cross their paths. It’s just that these things aren’t a focus of their daily lives. How do the different druidic sects and the Church of the Silver Flame tend to perceive each other? Personally, I think there’s very little interaction between them. The Church can’t possibly monitor every single sect or cult that exists in the world, and the druids aren’t especially interested in interacting with them; they’re doing just fine, thank you. WE know what the Gatekeepers are doing is vitally important, but to the world at large they are obsessing about something that hasn’t been a threat since before humanity came to Khorvaire. With that said, I’d think that they would have a generally positive view of the Wardens of the Wood, who likely assisted templars during the Lycanthropic Purge, and a generally negative view of the Children of Winter and Ashbound, both of whom take actions that can threaten innocents… and the Ashbound in turn will see the Church as channeling unnatural energy. Meanwhile, the Gatekeepers live in the shadows and don’t believe that they need the help of some human outsiders. WITH THAT SAID: In the last 5E Eberron campaign I’ve been playing in, the players include a Ghaash’kala paladin, a cleric of the Silver Flame (well, technically, Jaela Daran), and a Gatekeeper druid. We work together well because we do all share a common goal of protecting the innocent from evil, and we’ve been happy to pursue each other’s personal issues. But we’re still playing it that our respective organizations really don’t know a lot about one another. Furthermore, if primal magic does not require belief… could a druid believe in and follow the Silver Flame? The question I’d ask is why they become a druid in that case, instead of becoming a cleric. But other than that, there’s no reason they couldn’t. You could easily CREATE a sect of Silver Flame-inspired druids in the Eldeen who adopted the faith after fighting alongside templars in the Lycanthropic Purge. Are there any druidic traditions amongst the Blood of Vol? The Seeker tradition is largely urban and druidic traditions generally develop in the wild. Further, the goals of the Seekers are fundamentally TO BREAK THE CYCLE OF NATURE; combined with their affinity for undead, this would brand them as abominations in the eyes of the Children of Winter, if not most sects. When it comes to druids, are there any sects that tend to utilizing the feat from 3.5 “Assume Supernatural Ability”? Does it fit with any specific sect’s view on the world? Nothing particular comes to mind… but I don’t have time to go through and figure out a) what shapes a druid could take where this would come into play and b) the level that would be required to do so, which would affect how much it could really be central to a sect. You could certainly make a new sect around the idea. And are there any sects that use “Draconic Wildshape”? Are there any druidic traditions amongst the merfolk and sahuagin? What are some druidic traditions of the Vulkoorim drow of Xen’drik? I’m certain that there are aquatic druidic traditions. The Qaltiar drow have a tradition involving primal spirits, as seen in The Shattered Land and Gates of Night. But neither of these are things I have time to explore in this format. Once Eberron is unlocked for the DM’s Guild, I’d love to explore this in depth (or see what other people do with it). Is there any more information about the druid(s) that awakened Oalian and Kraa’ark Lors? Life in the Lhazaar Principalities revolves around the sea. What’s the possibility of there being a druidic sect in that area who focus on the sea life of the region; ensuring fishermen get bountiful catches, ensuring whaling ships don’t hurt the creatures unnecessarily, and predicting the hurricanes off the Sea of Rage? It’s a logical role for druids or gleaners, and something that has been suggested in passing; in particular, it’s been noted that Cloudreaver priests of the Devourer may develop druidic abilities, and the Wind Whisperers are a powerful force. With that said, we haven’t presented druids as a defining pillar of society in the Lhazaar the way we have in the Eldeen Reaches, so if I was writing for canon Eberron, I probably wouldn’t make them the secret masters of the Reaches. However, I could see adding in a gleaner sect that does exactly the sort of thing you suggest – ensuring bountiful catches, predicting storms, preventing overfishing. As a Gleaner sect they could exist without DOMINATING the culture; some respect them, some curse them as annoying busybodies. But they aren’t as dramatically powerful as the Cloudreaver druids or the Wind Whisperers. As a side note on the Wind Whisperers: In theory, their power comes from a connection to the Mark of Storms. In practice, I might give a powerful Wind Whisperer NPC druid, warlock or sorcerer levels with storm/lightning related magic reflecting a deeper connection to primal storms unlocked by the mark. So the power that makes them a force to be reckoned with is more than just the base abilities granted by the mark. What’s the tie between the Prophecy and Primal Magic? Aren’t both a direct expression of Eberron? If dragons know primal magic and druidism for millennia, should we suppose that a sect of very powerful, high level dragons/druids exist and take care of the equilibrium of Eberron? Powerful draconic druids do exist. The Child of Eberron is one of the core archetypes of the religion of Thir, as covered in Dragons of Eberron: All natural life sprang from the progenitor dragon Eberron, and the child of Eberron honors the Great Mother and defends her works. However, the vast majority believe that this is a task fit solely for dragons, not something that the lesser races should be involved in. There may be a few Children of Eberron acting within Khorvaire, but they aren’t working with lesser druids (whom Vvaraak should never have taught!) and are generally dealing with primal problems we don’t even perceive. Humans are like ants to them: part of the natural world, capable of forming communities, but of no directrelevance to their actions… and if you have to wipe out a bunch of them to do something important, they’ll recover from it. The critical example of this is Xen’drik: when the giants were about to take action that seriously threatened the equilibrium of Eberron, the dragons acted and utterly destroyed their civilization. The good news for us is that the Children of Eberron are generally only concerned with SERIOUS threats to the equilibrium of Eberron, like “destroying a moon.” Things that are just going to wipe out a bunch of human nations aren’t that big a deal… again, when you look at things from a perspective of millennia, they’ll grow back. With that said, I suspect the Children of Eberron are concerned with the Mourning, and could potentially be allies in a plot that seeks to solve this mystery… but again, if the answer to the Mourning is “humans did it” and there’s a chance they could do it again, there is a very real risk that Argonnessen would decide that human civilization should go the way of the giants. If primal magic is the result of invoking the primal spirits, using the secret names and rituals to channel natural forces, or tapping into the interconnectedness of all things through Eberron, how do druids and other primal casters use magic when they travel to other planes? In theory, primal magic is the domain of Eberron herself, so when traveling away from her, wouldn’t a primal spellcaster be cut off from their magic? Good question. The same problem applies to Divine and Arcane magic, which are fundamentally drawing on the power of Siberys; shouldn’t going to another plane separate them from this source? The short and simple answer is that no, it doesn’t. The Progenitors created all the planes, and all of the planes are connected to Eberron. The creatures of Eberron live and die, know peace and war, dream and go mad. This is because Eberron is touched by all of the planes. The same process works in reverse. Dal Quor may not have a direct connection to Thelanis, but it DOES have a connetion to Eberron, and this allows your caster to draw on the power of Eberron or Siberys. My next few post will be about Phoenix: Dawn Command, but I will be posting another Eberron Q&A sometime in the next few weeks; the topic will be Thelanis and The Fey. Post your questions about Phoenix or Eberron below! I’m working away on a number of different projects that I can’t talk about just yet, while waiting for Phoenix: Dawn Command to come back from the printer. One thing I can mention: I’m scheduled to be a guest at Acadecon 2016 (Dayton, Ohio on November 11th-13th), which is in the last few days of funding on Kickstarter. It’s a small event but has a great lineup of guests, so if you might be interested, follow the link and check it out. Meanwhile, I’ve got dozens of Eberron questions to work through, and many could be the subject of entire posts. But there’s a few that can be answered quickly, and I’m going to see how many I can get through in one sitting. If Eberron is ever opened for DM’s Guild, would you consider finally writing and publishing a complete Planes of Eberron? Absolutely. I have a long list of topics I would love to write about as soon as it is possible to do so, and the Planes are high on that list. Some planes have a key role in Eberron’s story and are very important for Eberron’s flavour. I mean Dal Quor, Xoriat, Dolurrh. Other planes, at least in core set, looks more as “a place where you can find some creatures that wouldn’t fit anywhere else”. But somehow I feel these creatures would need to be “eberronized”. I feel that all of the planes have much more to offer than simply being a source of exotic creatures. Each plane needs to be a compelling foundation for stories, whether the plane is the location of the story or something that directly influences it. I have deeper ideas for all the planes that have been revealed so far, and I feel that Mabar and Lamannia have just as much to offer as Xoriat or Dal Quor. And I look forward to writing about them as soon as it’s possible! Months ago, we discussed the idea of a Daelkyr obsessed with the Silver Flame and trying to make it stronger in creepy ways. Do you think it could work more on celestial versions of aberration, or maybe in aberrating celestials, like a half-illithid angel? In my opinion, part of what defines the material plane is that its inhabitants are innately connected to ALL of the planes. Humans live and die. They dream and know madness. They can fight wars and find peace. They are already connected to every plane, and that makes it relatively easy for them to be corrupted or transformed by the influence of planar beings. Beyond this, most mortals are creatures of flesh and blood, influenced by genetics, disease, and similar factors. So creatures of Eberron are easy clay for a daelkyr to work with. By contrast, immortal outsiders are formed from the pure essence of a single plane. They are ideas given form, only loosely bound to physical reality. An archon from Shavarath is a pure embodiment of war. It wasn’t bred or born; it embodies an idea, and madness isn’t part of that idea. So I think it’s far more difficult for a daelkyr to transform an angel or a quori that to affect a mortal. With that said, anything is possible if it makes a good story. In a way, you can think of an angel as a piece of computer code as opposed to a being of flesh and blood. If the daelkyr could find a way to hack that code and rewrite the fundamental idea that defines the angel, they could twist it. It would just be a completely different process from the fleshwarping techniques they use on the creatures of Eberron. If a paladin of the Blood of Vol who grew up in the ranks of the church or in another way discovers the true nature of the cult, would he lose his abilities? Or do you think in Eberron can exist a corrupted paladin or a paladin without a faith? PERSONALLY, I hold paladins to a very different standard than clerics. I am a firm believer in the idea that you don’t choose to be a paladin: it is a divine calling that chooses you. As such, I do feel that it is vital for a paladin to remain “on-mission” and that a paladin who loses faith would lose their abilities until they could find their way back to it. With that said, I feel that paladins are defined by THEIR view of their faith. Clerics typically work through doctrine and study; an illiterate farm girl could become a paladin if she is called. She won’t lose her powers just because she’s excommunicated, and she’s unlikely to lose her faith after encountering a single corrupt priest; instead, she will likely be inspired to follow her calling and do something about that corruption. This is especially true in the case of the Blood of Vol. Where do divine casters tied to the Blood of Vol draw their strength? The Divinity Within. Seekers believe that we all have the divine spark in our blood – that we could all be gods, and that we were cursed with mortality to keep us from reaching this potential. A paladin of the Blood of Vol isn’t getting her powers from an outside source; she has been called by her own divine spark, her own potential urging her to protect her people and fight death. Add to this, I actually think the faith of the Blood of Vol has no more corruption than any other organized religion in Eberron… it’s simply that it’s called out more dramatically in Erandis. I believe that the majority of priests of the Blood are committed to the principles of their faith. In my campaign, Malevenor is a true Seeker and Atur a stronghold of the faith. The leaders of the Order of the Emerald Claw are corrupt and abusing the faith of their followers, but the devoted priests far outnumber the corrupt. Now, if your question was “If a BoV paladin raised in the Emerald Claw discovered the corrupt nature of its inner circle, would she lose her faith and her powers,” I think she would turn on the corrupt priests – but I don’t believe that this would shatter her faith in the basic principles of the religion, especially since her divine power actually comes from within her, and isn’t in any way a gift from those corrupt priests. A long time ago you wrote that you were playing an orc paladin of Demon Wastes and that you were going to tell us about this experience. I think it is a very interesting point in Eberron. How can a few of orcish tribes stand against all the demons of Demon Wastes? There’s many more questions you could ask. Where do the demons of the Demon Wastes come from, anyway? What do they do when they aren’t trying to escape the Wastes? Why don’t the demons just go AROUND the Labyrinth? Why were the Ghaash’kala first chosen to guard the Labyrinth, and who set them there? And setting aside the demons, how can the Ghaash’kala survive in such a harsh landscape? What to they eat? Where do they acquire their weapons and armor? This is a big topic, and when Eberron comes to the DM’s Guild the Demon Wastes is a topic I intend to explore in detail. But here’s the high level overview. There’s far more going on in the Demon Wastes than outsiders realize. It is a web of manifest zones, ancient wards, eldritch machines and demiplanes. Just as the modern Gatekeeper Druids hold back the Daelkyr by maintaining the ancient wards, the Ghaash’kala are also working with tools that date back to the Age of Demons and the foundation of the Silver Flame. As for how they obtain resources and food, they forage in Khyber. There are entrances to Khyber all across the Demon Wastes. When I say “Khyber” here, I don’t mean physical caves; I mean the demiplanes where demons are bound and born. Essentially, the Ghaash’kala raid the Abyss to obtain resources that aren’t available on the material plane. Needless to say, this is the very tip of the iceberg… but I look forward to explaining in greater detail when it’s possible to do so. I have a new group of players. They would love to play or a team related to Greensingers or to Ashbounds. But I feel like Greensingers are nice people singing and getting drunk in the almost-innocent plane of Thelanis and Ashbounds are interesting only at low levels, since their natural enemies are humans. Would you have any suggestion for either a Greensinger or Ashbound campaign? I have a very different view of each sect, and I think you could definitely run a campaign tied to either sect. If I was going to run a campaign based on the Greensingers, I’d start by developing their Fey patrons. I’d want members of the party to have ties to different patrons, and to work with each player to develop their own personal goals. These could be tied to threats that are passing from one realm to the other; to the plight of the Feyspires; or to ancient bargains or pacts established by the Fey themselves. I’d look at the depiction of Bast and the fae in Wise Man’s Fear by Patrick Rothfuss, or in my own novels Gates of Night or The Fading Dream. In my view, a Greensinger campaign could have all the action and suspense of Mission Impossible and Ocean’s Eleven spread across two planes. The Greensingers are tied to a secret world most mortals know nothing about it, and they alone know how that world threatens and is threatened by Eberron. As for the Ashbound, the last thing I’d worry about is that their threats are primarily low-level or human. The stereotype of the Ashbound is that they are crazy fanatics who run around burning down Vadalis magebreeding facilities, and some of them do. But the basic drive of the Ashbound is to protect the world from the unnatural influence of magic, and there’s a lot of that going around. Perhaps you’ve heard of the Mourning? If I was running an Ashbound campaign, I would emphasize the terrible threat posed by the irresponsible use of magic. Driven by greed and the thirst for power, the Five Nations and the Dragonmarked Houses are pushing the limits of magic further and further. Concern of a second Mourning is certainly a possibility: but you can also emphasize the smaller scale horrors such research has unleashed. Explore the biological weapons Jorasco’s nosomatic chirugeons are developing, or the war magics Minister Adal is exploring in his quest to ensure victory in the Next War. Expand on Magebreeding… the experiments that have gone horrible wrong and the creations that Vadalis cannot control. and that’s not even touching demons and other unnatural magical entities that are anathema in the eyes of the Ashbound. You can play the Ashbound as zealots who primarily bother humans… but you can also play them as champions fighting a secret crusade against threats and villains the common folk don’t know about. You can play them as fanatics… but they can just as easily be the supernatural world’s answer to the Men in Black, protecting the innocent from arcane terrors they never even know about. What relations to Night Hags – any of the nine supposed to inhabit the Demon Wastes, and great Sora Kell herself – have with the Quori? We know that they had a quasi-neutral situation as ambassadors in the Dragon-Fiend wars, but they also have powers over dreams. How do the Quori feel about this, and, conversely, do the hags know about the previous incarnations of Dal Quor? There’s no canon answer to this. If you’re asking how I’d run it: First off, keep in mind the vast scale of Dal Quor. Every creature that dreams visits Dal Quor… and we’ve also indicated that there’s regions of Dal Quor made up of the dreams of long-dead entities, and places like the Citadel of Fading Dreams. Natural dreams are created through the interaction of the dreamer’s subconscious with the mutable reality of Dal Quor. Quori have the power to override this and alter an individual’s dreams, but it’s not as if they are personally monitoring and shaping EVERY DREAM. As a result, if your wizard uses Dream or Nightmare, he’s not innately stepping on the toes of the Quori; he’ll only draw attention if he happens to mess with a dream a Quori IS directly shaping for some purpose. So you COULD say that the Night Hags fly under the radar of the Quori; they have enough experience to recognize when a dream is being manipulated by Quori and choose to avoid interfering. However, I’d personally say that the Night Hags are known in Dal Quor – I think they’d extend their role as fiendish ambassador to include their interaction with Dal Quor. I think they’d HAVE to know more about the previous incarnations of Dal Quor than the Quori do, which would be an immediate basis for a relationship. It could be that they have helped shape the Quori reaction to the turn of the age in this and previous ages… they might have even set the Quori-Giant war in motion. The short form, though, is what works best for your story? Do you want a Night Hag to be able to act as a neutral intermediary between the party and il-Lashtavar? Would you like to have a Night Hag with a bitter feud with a powerful Quori… or a deep love formed in a previous age, leading her to want to force the turn of the age in the hopes of restoring her lover’s spirit to the form she once knew? It’s up to you. What is the difference between some of the Rajahs who seem to step on each other’s toes: (a) Bel Shalor is a spirit of treason, but so is Eldrantulku. Though I assume Bel Shalor is more of the classical temptor and corruptor of innocence. (b) Sul Katesh is the keeper of secrets, but Tul Oreshka also has power over them. (c) Dral Khatuur and the overlord served by Drulkalatar are spirits of the wild, though Dral Khatuur is more specialised in cold. Bel Shalor is more about corruption while Eldrantulku is about chaos and discord. Sul Khatesh is the master of arcane secrets, while Tul Oreshka knows the secrets that will drive you mad. Sul Khatesh knows incantations that can destroy cities or raise the dead; Tul Oreshka knows what your lover truly thinks about you, and what’s lurking underneath your bed in the dark. Dral Khatuur embodies the chill that kills the harvest and saps the strength of the strongest man. The Wild Heart is the predator that lurks within, the rabid instincts that lie beneath the surface waiting to be unleashed. The key is that the Overlords are fundamentally about the EVIL that their spheres can do – the things that cause fear and death. There’s nothing positive about Dral Khatuur; she embodies the killing cold. She’s not part of the natural cycle; she will bring unending winter. Likewise, the Feral Master is a corruptor of natural impulses, turning innocents into savage monsters. Back on the WotC forums, in the days when they existed, you mentioned that you had details on Dral Khatuur and her place of imprisonment, but had to clear it with WotC whether you could release any information. Has there been any movement on this? I have a 10,000 word backdrop on Dral Khatuur and her prison in the Frostfell. If Eberron is unlocked for the DM’s Guild I’ll see if I can revise it and post it there. How do various Rajahs – or, for that matter, gods – interact with planes that are within their spheres: Dral Khultur with Risia, Rak Tulkesh with Savarath, the Wild Heart with Lamannia, Katashka with Mabar and Dollurh, and so forth? As I mentioned above, Eberron is touched and influenced by all the planes. The Overlords are fundamentally spirits of Eberron and as such reflect how the planes influence mortals as opposed to having some sort of personal tie to the planes. So Tul Oreshka is strongly tied to Madness and has a closer connection to Xoriat than to the other planes… but that’s just an amplified version of the connection ALL mortals have to Xoriat, and it doesn’t mean that she has some sort of bond to or influence over the Daelkyr or other creatures of Xoriat. That’s all I have time for today. As always, leave your questions and comments below!